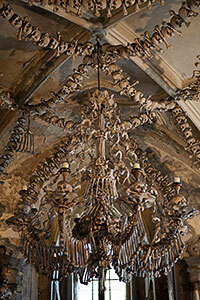 Kutná Hora is known for the curious "Bone Church" or Ossuary (in Czech Kostnice). 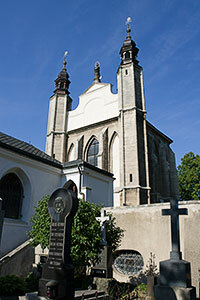 It is located in the suburb of Sedlec. The Ossuary is in the undergroud chapel of the Church of All Saints. 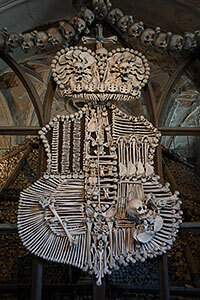 It contains the bones of about 40,000 people who died of the plague in 1318 and during the Hussite wars in the 15th century. They were originaly buried at the church cemetery. When the cemetery was closed at the end of the 15th century, the exhumed bones were transferred to the chapel and compiled into pyramids. In 1870, František Rint of Česká Skalice arranged the bones and skulls into creative decorations that include bells, the Schwarzenberg coat-of-arms, and a chandelier. Nov. - Feb.: 9 a.m. - 4 p.m.
Oct. & Mar. : 9 a.m. - 5 p.m.
Apr. - Sep.: 8 a.m. - 6 p.m.
Sundays: 9 a.m. - 6 p.m.
Sedlec is located about 1 km/0.6 mi from the main Kutná Hora train station (hlavní nádraží) and 2.5 km/1.5 mi from the city center. It is an easy walk from the train station and an even easier train or bus ride. 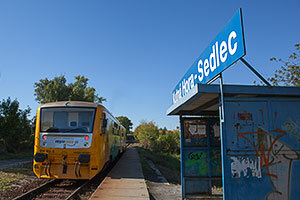 By train: The local trains that connect the train station with the Kutná Hora city center pass through Sedlec. Get off at the first stop (Kutná Hora-Sedlec). It is a request stop, so press the request-stop button (zastávka na znamení) by the door after the train gets going. By bus: Kutná Hora city buses no. 1 and 7 connect the train station with the town, passing through Sedlec. There's usually a bus leaving the station soon after the Prague train arrives. Get off at the second stop (Sedlec,Tabák) and follow the signs to the Ossuary. By Tourist Bus: The private 8-seater Tourist Bus runs between the train station, Ossuary and city center. You can try to catch it at the train station. The ride is quite cheap. You can also take the minivan from the Ossuary to the city center. By taxi: There may be a taxi waiting at the train station that can take you to the Ossuary. If you're going to the main train station from the Ossuary, keep in mind that the buses run only every 30 minutes on work days and hourly on the weekends. Local trains from the Kutná Hora-Sedlec stop to the train station run every 15 - 40 minutes. Walking will take you about 15 minutes. A walk from town to the Sedlec Ossuary takes close to 45 minutes, so it is best to use some form of transport to get there. By bus: City bus no. 1 runs every half hour on work days, bus no. 7 every hour on the weekends. You can catch it at the bus station or the Centrum stop. The ride takes about 15 minutes. 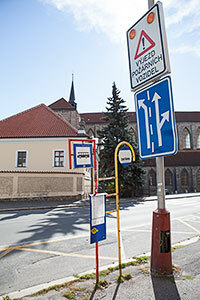 Get off at Sedlec, Tabák by the Philip Morris factory (which is, sadly, right next to the Cathedral of Our Lady) and follow signs to the Ossuary. By Tourist Bus: The private 8-seater Tourist Bus runs between the Church of St. Barbara and the Ossuary. At least three people must be traveling. 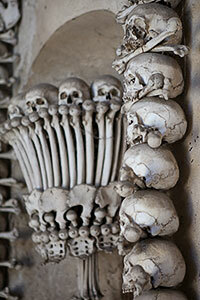 You can also take it from the Ossuary to the city center. By taxi: Catch a taxi on the town square or call one by phone. See our Getting Around page for some contacts.